The show debuted on Thursday, January 30, 1975, but it was unsatisfying, at best. “To all Lew Archer fans,” wrote Cecil Smith in the Los Angeles Times, “I must regretfully report this ain’t him.” Francis Murphy, who wrote the “Behind the Mike” column for The [Portland] Oregonian, was a bit more generous, remarking that “in the opening episode Keith displayed the proper amount of weary cynicism as Ross Macdonald’s celebrate private eye.” Nonetheless, NBC announced within a month that the program had been cancelled, and it went off the air on March 13, 1975, after only six episodes were broadcast. 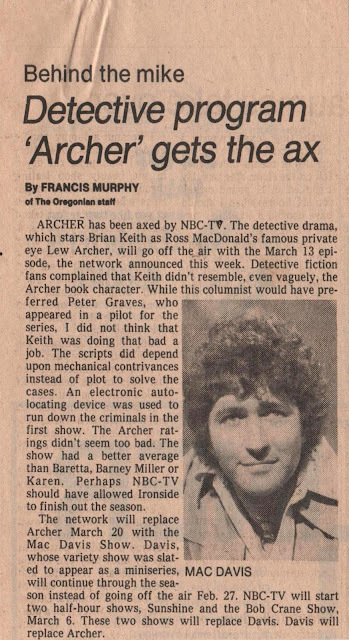 The clips below are from Murphy, the first one remarking on Archer’s premiere episode, “The Turkish Connection,” the second bringing news that the Thursday-night timeslot occupied by Keith’s series would be filled by The Mac Davis Show (1974-1976).